Unfortunately, a chip that's as smart as a cat is still years away. 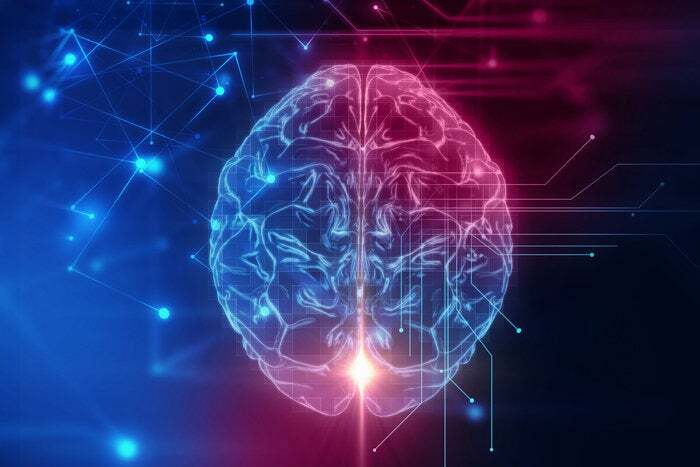 Intel said this week that a system based on its Loihi chip planned for 2019 will include the equivalent of 100 billion synapses, which is about the same brain complexity as a common mouse. Last September, Intel introduced the world to Loihi, a chip designed for what Intel calls probabilistic computing. Intel sees probabilistic computing as an important step on the road to artificial intelligence. Unlike a Core chip, which uses a sequential pipeline of instructions, Loihi is designed to mimic the way the brain works. The version of the Loihi chip that Intel introduced last year included 130,000 silicon “neurons” connected with 130 million “synapses,” the junctions that in humans connect the neurons within the brain. This week, Intel said it’s increased its goal, with its 2019 plan calling for more than 100 billion synapses within a Loihi “system.” An Intel spokesman said Monday that the roadmap calls for "one large, multi-chip system," rather than a single chip. What we do know, though, is that scientists have worked on modeling the cortex of various animals for several years, giving us a point of comparison for evaluating how sophisticated these neural networks actually are. 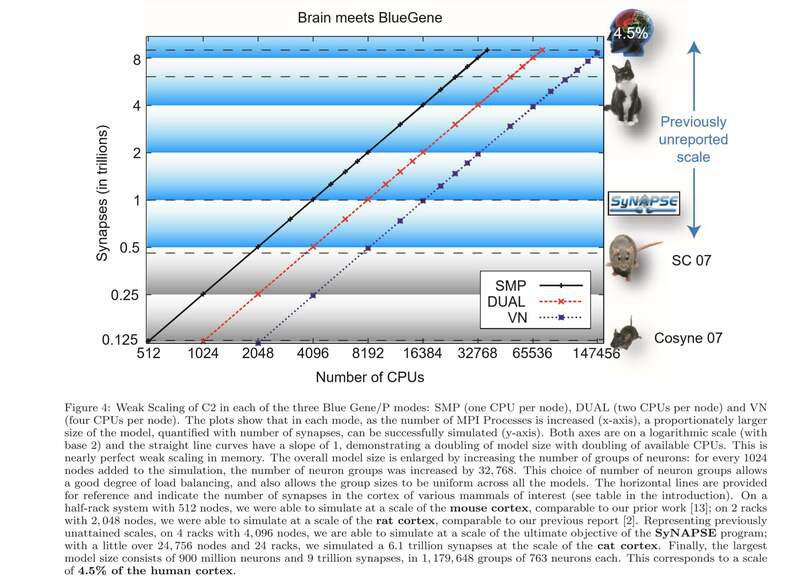 In a 2009 paper (PDF) from Rajagopal Ananthanarayanan, Steven K. Esser, Horst D. Simon, and Dharmendra S. Modha of IBM Almaden and Lawrence Berkeley National Laboratory, the research team simulated the cerebral cortex of a cat using LLNL’s Dawn Blue Gene/P supercomputer with 147,456 CPUs and 144TB of main memory. In an accompanying graphic, the team shows the relative synaptic complexity of several animals. At the bottom, with 125 billion synapses, is the common mouse—slightly higher than the complexity the Loihi system will achieve, and evidence of how far Intel and others have to go to achieve “true” artificial intelligence. As the graphic indicates, the next step is the rat, with about 500 billion synapses. But if Intel’s progress is charted linearly, that could require several years to achieve. Far ahead, of course, is the cat cortex, estimated at about 6.1 trillion synapses. And humans? Nine trillion synapses equates to about 4.5 percent of the human cortex, meaning that you’ll have to wait a few decades to achieve the equivalent of a human brain on a chip. On the other hand, the joint IBM/LBNL paper was authored in 2009, so who knows what simulations companies like Google are working on behind the scenes with actual supercomputers. Intel continues to work with researchers to test the Loihi chip. It was most recently shown off at an academic conference in Canada, running a keyword recognition app and, separately, a neuomorphic robotic arm controller that could react to unexpected changes in weight or orientation. Intel said it’s seeking academic proposals until May 25 of this year. What this means to you: As multiple companies work to incorporate artificial intelligence into their products, one question that has to be asked is: Well, how do you measure artificial intelligence, to know who's ahead? It's not an easy question, especially when you're measuring different implementations (AI via the cloud, AI on a chip, or AI on "edge" devices like a PC) or simply trying to figure out which company is best at handling different tasks. This is a very specific implementation of AI: modelling the human brain. Here, though, context is king: We now have an idea of how quickly Intel is progressing, compared to animal intelligences we're familiar with.